For all your wires, cords, chargers and earphones. With campaign funding exceeding 125% of goal, Fabricate Inc., a Toronto-based product innovation lab and inventor of the popular Nearbuds™ accessory, has wrapped up a successful Kickstarter crowdfunding campaign to complete the journey to market of its hotly anticipated management and storage solution for a broad range of cords, cables, chargers and earbuds. Universal Nearbuds™ are powerful magnetic storage clips designed to help neatly and conveniently organize, stash and store wires of all kinds, at home and on the go. 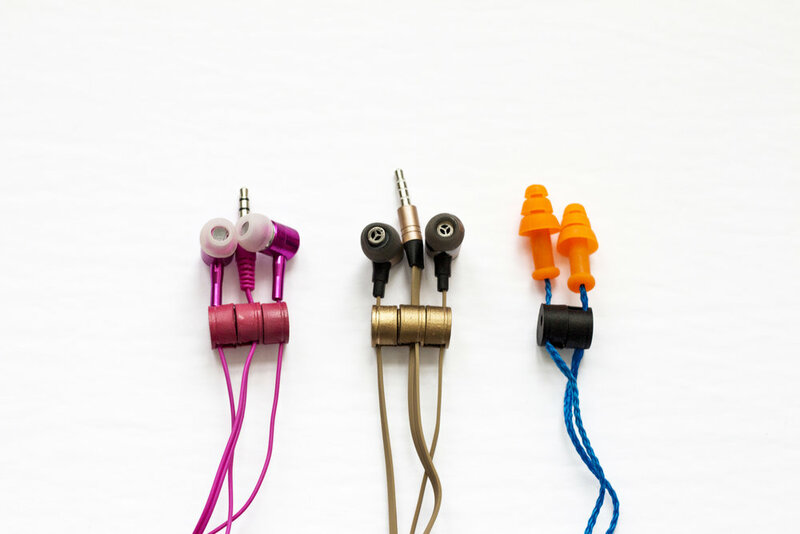 Available in six (6) colours and featuring powerful Neodymium rare-earth magnets, Universal Nearbuds™ clip onto earbud and charger wires, allowing for a multitude of functions to fit any lifestyle. Each package contains three magnetic clips, as well as a handy self-adhesive, magnet-friendly steel disc. Fabricate Inc. uses smart “Snap-On” technology to ensure no glues are required in the manufacturing process. This means the magnets will never come apart from their housings. Universal Nearbuds™ are 100% satisfaction-guaranteed. Universal Nearbuds™ clip to earbud cords and magnetically snap together, so it’s a breeze to stow headphones behind your neck or throw them in a backpack or tote. Better still, Universal Nearbuds™ attach to charger cables, so you can organize all your chargers by simply snapping them to the self-adhesive steel disc included in each package — or to any other magnet-friendly surface. Additionally, Universal Nearbuds™ are a perfect complement to corded industrial earplugs, Bluetooth neck-style headphones, even sunglasses and eyeglasses cords. The initial concept for Nearbuds™ stemmed from Canadian entrepreneur Luke MacKay’s frustration with tangled earbud wires, lost and damaged earbuds and dangling piles of charger cords and cables. Fabricate Inc. successfully introduced original Nearbuds™, magnetic clips specifically designed to fit Apple® Earbuds™, in 2014, with an overfunded Kickstarter campaign. In May 2018, after extensive testing and feedback from distributors and retailers, the company completed another campaign, this time on Indiegogo — once again overfunded — to develop a Proof Of Concept for a redesigned, improved version. Universal Nearbuds™ fit not only Apple-type earbuds, but just about any wired earbuds – not to mention chargers, cables and cords – to keep wires safe, tidy and tangle-free. The fully funded Universal Nearbuds™ campaign, which ran on the popular Kickstarter crowdfunding site from June 27 to July 27, 2018, raised over CAD $6,400 (128% of goal) during the 30-day period. Perks included special early-bird pricing and customized color and product bundles.